These is instruction from Microsoft Windows Seven and for its users. To connect your computer to a TV, your computer needs to have an output port that matches one of the input ports on your TV. 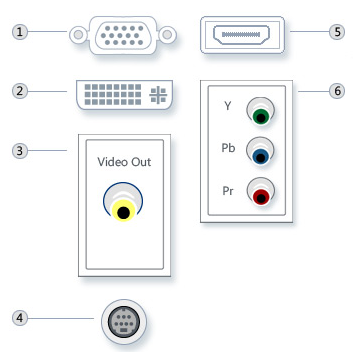 Below here is a picture that shows several types of computer video output. Because almost every computer has an output port, you can use a cable to connect your computer to your high-definition television (HDTV). Most computers have a VGA output port (so using VGA cables is very common). Others have Digital Visual Interface (DVI), high-definition multimedia interface (HDMI), or component video output ports, which all require different kinds of cables. If your computer has HDMI output port, it should work with HDMI TV input port, by using HDMI to HDMI cable. If your computer has DVI output port, it should work with DVI or HDMI TV input port, by using DVI to DVI or DVI to HDMI cable. If your computer has VGA output port, it should work with VGA TV input port, by using VGA to VGA cable. Most standard-definition TVs support only composite video or S-Video connections. If your computer supports one of these, you might be able to connect it to your TV. However, both of these connection types will result in displays that are not as sharp as the results you get with an HDTV or with a standard computer monitor. If your computer has Composite Video output port, it should work with Composite Video TV input port, by using Composite Video to Composite Video cable. If your computer has VS-Video output port, it should work with S-Video TV input port, by using S-Video to S-Video cable. Turn off your computer and position it within easy reach of your TV. Disconnect the monitor, but leave the mouse and keyboard connected. Connect the appropriate video cable from your computer's output to your TV. Turn on your TV and set it to the input that matches the output on your computer. You might need to refer to the user's guide included with your TV for instructions on how to do this. You should see Windows displayed on your TV. If the screen looks stretched, or part of the screen seems cut off, you probably need to adjust the screen resolution in Windows. If you can't see Windows on your TV, you might need to reconnect the computer to your monitor and adjust the screen resolution before you connect to your TV. Cables for VGA, DVI, and component video don't support audio signals. However, HDMI cables do support audio signals, but not all HDMI-enabled video cards support audio. If your HDTV has an audio input, you might be able to connect a separate audio cable from your computer sound card directly to the TV. Otherwise, you'll need to connect the audio signal to a different device, such as external computer speakers or your home stereo system. For more information about sound cards, see Sound cards thread in the another post. If your computer doesn't support the type of video connection you need, then you might be able to install a new video card that has the right connection. 3 responses to "Connect Computer to a TV"
Connect the computer to the TV screen will be useful for displaying presentations or even videos on a large screen and easy to use TV as a monitor. When using the TV as a monitor, it will be important that have come to the screen resolution possible for the small text on the desktop and windows can read.